Our readers who follow us on Instagram will know that we have seen lots of amazing garden sculptures recently. First, during our visit to the wonderful Abbey House Gardens in Malmesbury, where both the formal and woodland gardens are home to some wonderful pieces, and since, at the incredible Elemental Sculpture Park, Somerford Keynes. Both visits have really inspired us to try our hand at making some sculpture for our own garden. 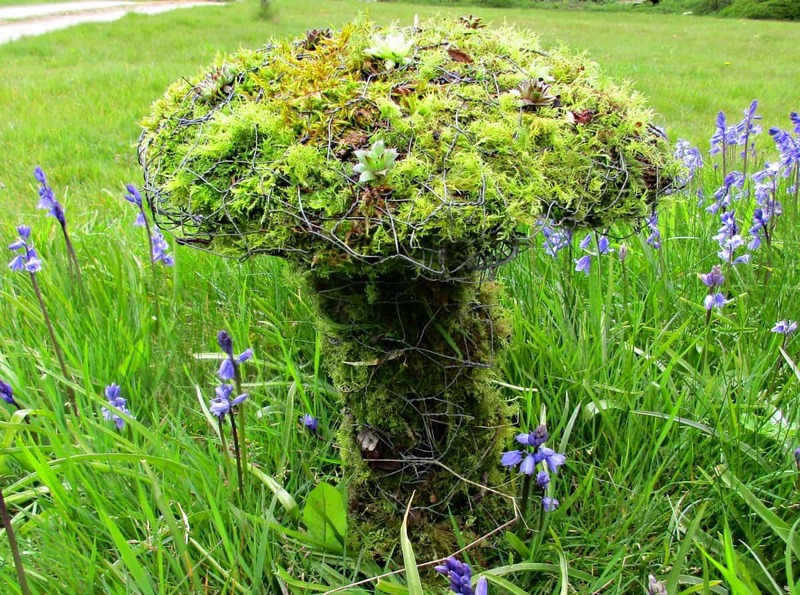 We started with a Chicken Wire and Moss Toadstool which turned out to be really simple to make. To start, I folded an old piece of chicken wire into four to make a square. I then wrapped it around a bowl to give a rough shape of a toadstool. Although I did then have to open the wire up again to remove the bowl, I think it still really helped to get the basic form. 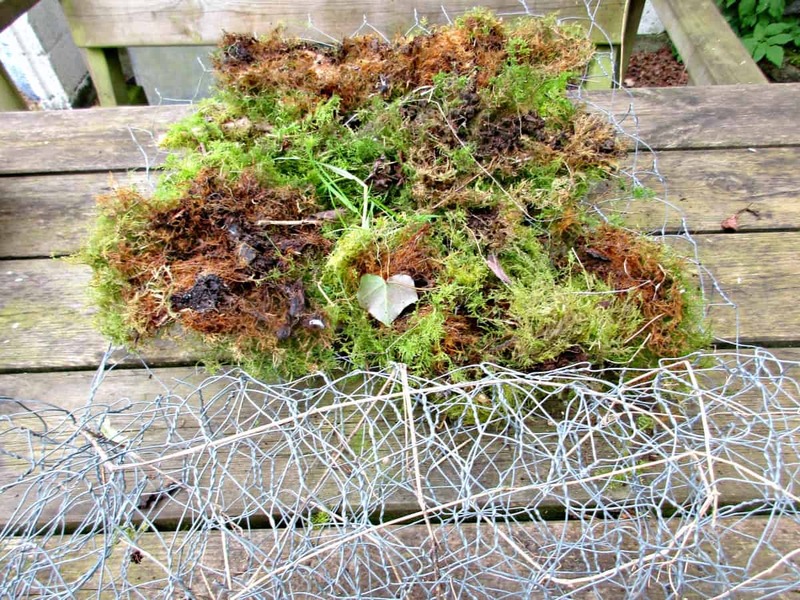 I filled the wire form with moss that we collected from a wooded area behind our house. The area we live in has a clay soil, and is permanently damp, so we have an abundance of moss. 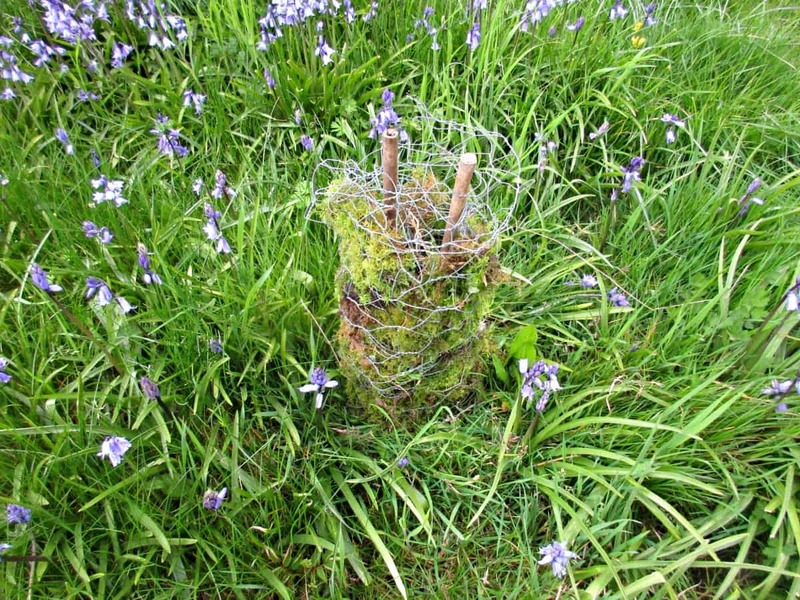 Please to bear in mind that many species of moss are protected in the UK so I recommend that you only collect it with the landowner’s permission, and in a way which is sensitive to the environment. 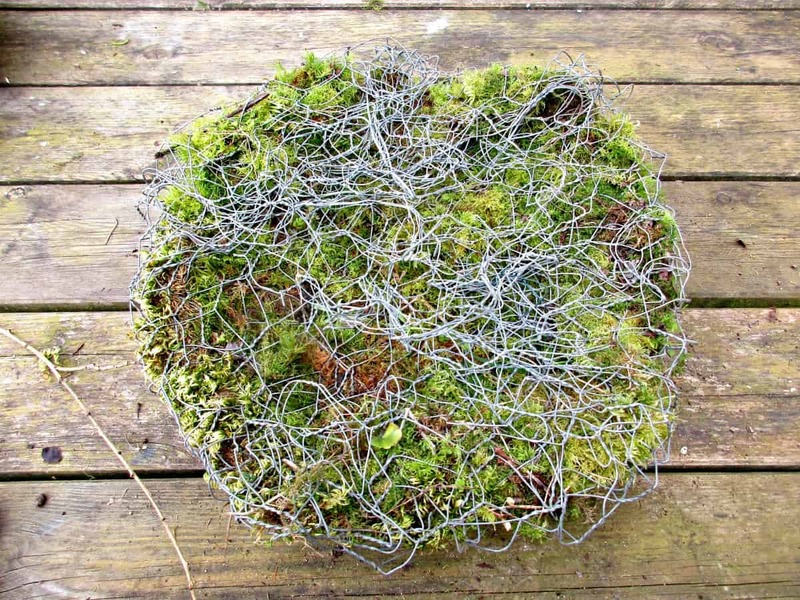 Once the shape was filled with moss, I folded the wire in, underneath, to hold the moss in place. Using a pencil to make little planting holes, I planted tiny succulents straight into the top. 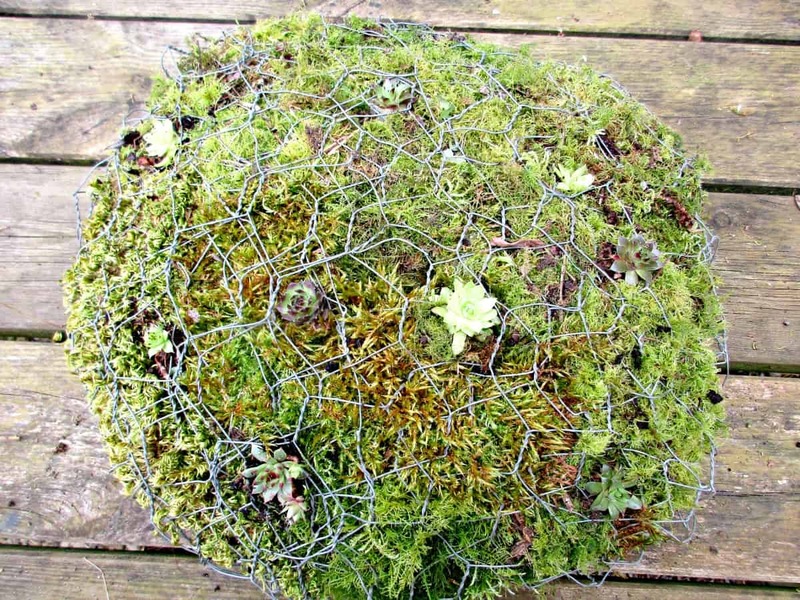 To make the stem for the moss toadstool, I used another piece of chicken wire. This time I folded the wire in half, and then rolled it up into a tube, lining the final third with a little more moss. I used bamboo canes to secure this to the ground, and to help secure our top to the stem. 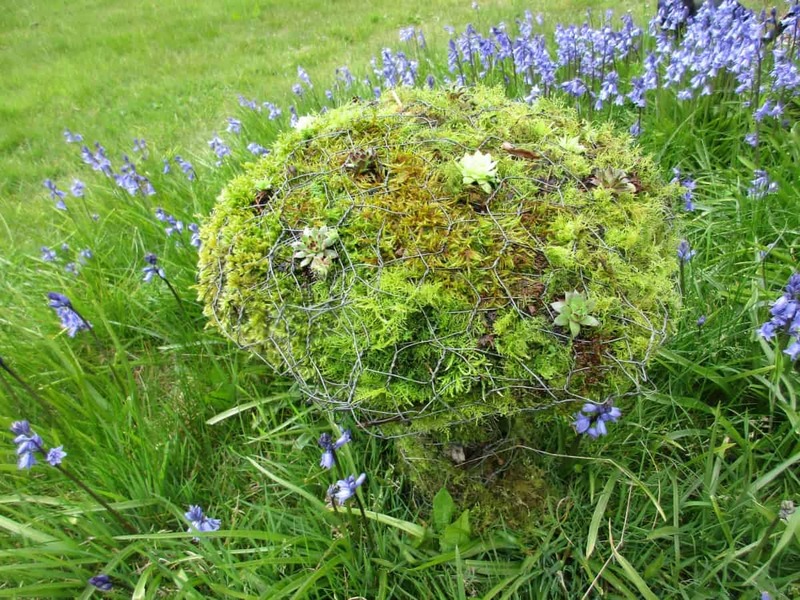 From start to finish, our chicken wire and moss toadstool only took about half an hour to complete. It was super easy to make, and it really does look fabulous. I plan to move it to a more shaded area of the garden, which will be a nicer habitat for the moss, and hope that it will continue to grow and develop over time. For more garden craft inspiration check out our Concrete Hand Sculptures, our Garden Art made from succulents and our cute Succulent Hedgehog Planter. First Birthday Filco Keyboard Giveaway! I adore this project and can’t wait to try it out this summer. I wonder if you occasionally spray it with a slightly watered down buttermilk solution as I have heard it helps moss grown on objects that would perk it up and help it grown during dry,spells? It looks lovely and I would like to try something a little smaller as I live in a condo with a small garden patch just outside my patio. Lovely. Thanks for the tip Ann. I have heard of spraying it on pots to encourage lichen to grow but not thought of applying it directly to moss – I’ll have to try it out! This is so cute and so “British” – I went to visit back in the early 80’s and fell in love with all things “Britain” especially the gardens and woodland areas. Wish I had the money to come back. You are so right Rhonda 🙂 I love the ‘greeness’ of our countryside – I always miss it of I visit another country! Wow this is so creative! I love it! Out of interest how did you get on with it over the summer? When it begins to dry….mix green food coloring with water…put in spray bottle…and squirt away! I do this annually to some of my moss creations! Sarah this is really cute. I have never seen anything like it before and certainly wouldn’t know how to make one if you hadn’t shown us. They make a lovely addition to any garden. Thanks for providing us with some sweet inspiration. Sarah this is brilliant, how fab would this look in my fairy gardens? I wonder what will happen to the moss over time? Will it shrivel or hold it’s shape and brown, do share what happens to it over the summer. It looks amazing right now and ready for minibeasts and fairies to play. Thank you for sharing on #Trash2Treasure. Is that my badge gone squiffy at the top? Yes caves is fun too, stick person’s tea party inside. The ideas are endless! You do the coolest projects with the kids, I love this! I’ve never seen anything like it before and love that you can do it yourself with a few supplies. Yours is shaped really cool and I love that it’s sitting in the middle of the bluebells. What a fun project! It turned out great. Thanks Nikki, I have a thing about moss so I love it – do you get much moss over in your part of the States? I love this Sarah. I have a shady place at the bottom of the garden where something like this would be perfect. Oh this is gorgeous! What a lovely idea, I might try this myself. It’s great that you mentioned being careful about the moss too, I don’t think people always realise that it can take some time to grow and should be protected. This is brilliant, you really have a skill there! So magically beautiful, love it! Thank you, there’s something really special about moss isn’t there? I love this idea! 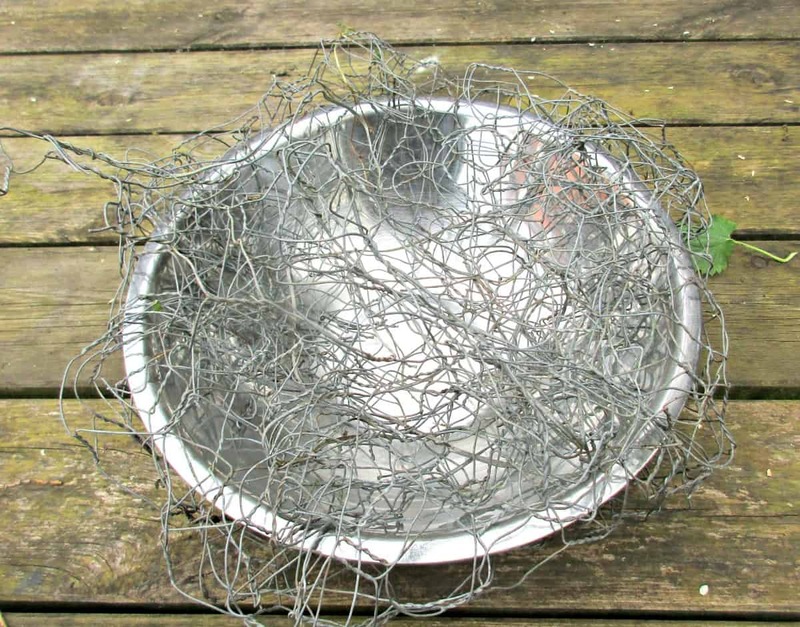 I never thought about using chicken wire and miss as yard decor! Thanks for sharing this! Awe!! So cute… this would look so cute at my house. How quaint and beautiful looking this is…and so much easier to make than I would have thought! It looks like it stepped right out of Alice in Wonderland, and would be inhabited by all manner of gnomes and faeries. This whole idea is amazing and beautiful! What a special talent! Hi Sarah, how clever! I wouldn’t know where to start to create something like this, but you’ve made it sound so easy. I’m sure that your ornamental toadstool will continue to grow and make an interesting live garden ornament.